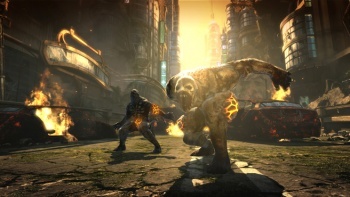 The Fox News Bulletstorm fiasco probably ended up boosting the game's sales but Epic Games President Mike Capps worries that such stories ultimately have a "terrible" impact on the overall game industry. You might recall something about the little kerfuffle that surrounded the Fox News coverage of Bulletstorm back in early February. You know, that thing where it said it could turn gamers into rapists. And although it will probably come as no surprise that all the publicity may have actually given the game a push, Capps nonetheless thinks that in the grand scheme of things that sort of negative coverage is actually very bad for the industry. "For what [the Fox coverage] did for Bulletstorm... yes, there were people who were very excited about any attention at all. For a game that's over-the-top, they probably helped sell more units than they convinced people to pick at us," he said. "What was most exciting about it for me [was the reaction from the media in the industry defending us]. Every journalist said this Fox report is junk... It's wonderful to see a media that's defending free speech." But in spite of all the side-effect upsides, Capps was less enthusiastic about the impact of such reports on the game industry as a whole. "I think it's terrible," he added. "There are people who really respect Fox News' opinions and look at that and are [convinced that video games are bad]." Capps said he had "a pretty good feeling" about Bulletstorm sales so far and predicted that the game will break one million unit sales.